Sonica realized the design of the first international offices and EMEA headquarters for software company, HubSpot, located in Dublin, Ireland. When HubSpot established its first international office and EMEA headquarters in Dublin in 2012, few of us could have imagined the growth and success they would see. By March 2016 HubSpot were well on their way to reaching their goals with the exciting launch of their EMEA HQ. Sonica were appointed early in the process to project manage the complete fitout; working collaboratively with HubSpot’s international design team. The project was broken into two major phases with the first being to design and build a brand-new floor for the growing team of 90 people with space for a total team of 160 employees in the Product & Engineering department. This iconic space “brings the outside in”; referencing the local environment in Dublin through splashes of familiarity while also individualising the space to match the needs of the teams. First; to forge a conference and event centre to be used by #DubSpotters for everything from internal All-Hands meetings to hosting external industry events with industry guests and partners. Third; to create a dedicated corporate reception to receive guests to their EMEA HQ. The result is an office that has been received with great fanfare by staff and media alike. 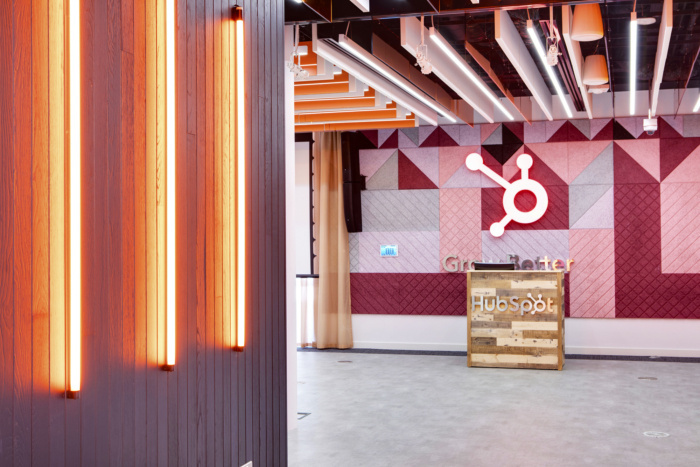 The space is unmistakably “Hubspot” but the local teams have put their unique stamp on this Dublin space; making it truly “#Dubspot”. The office is truly alive. It’s as though energy, laughter, productivity, communication were factored into the planning, and this is a space that buzzes with anticipation.